This financial literacy course looks at shopping and saving money in your local area. The course covers budgeting, benefits, saving and borrowing and includes trips to local shops to find the best buys near you. Cash Confident runs regularly throughout the year. Highlights of past courses have included a sessions from the council's Advice Shop, and excursions to Aldi and Morrisons to compare prices on a range of everyday goods. 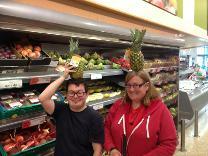 Khiara and Andrew definitely enjoyed their visit to the fruit section! The course covered all aspects of everyday budgeting. As all our learners agree, it's not just about getting the best price, but the best value! "I feel more confident about where to get help with money and money advice."